There are a few mermaid skins available for those who wish to sport the mermaid look, but they of course face the limitation of… Well…. Having feet. 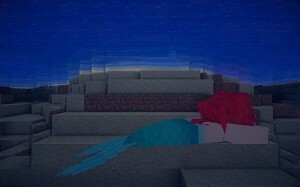 This new Mermaid mod by pau101 allows users to forever transform into a mermaid, tail and all! These tails are the mod’s presets; other colors can be produced by changing one’s skin, as the bottom eight pixels are averaged to create a tint. Interestingly, the player cannot choose their tail style in-game – rather, it is chosen automatically based on what pixel is at the (0, 1) position for the skin currently in use. Even while walking, the character will have a tail instead of legs. The arms and body move normally, which makes walking still seem natural for the most part despite the character having no feet. The tail simply tags along for the ride. Once you step inside the water, however, the full effect of this mod shines through. Your character swings its arms forward and propels itself through the water, looking just like a mermaid. Players swim at the normal speed as usual, however; this mod is just for small visual effects. It is a simple mod that mermaid lovers are sure to enjoy. Download the latest version of the Mermaid Mod. This mod is still listed as only 80% complete – can you think of any interesting or logical features to add into this before it is dubbed final? The first thing that comes to mind for me is the ability to simply toggle it on and off. Others have suggested items that enhance mobility and survivability in water. Leave your ideas in the comments!